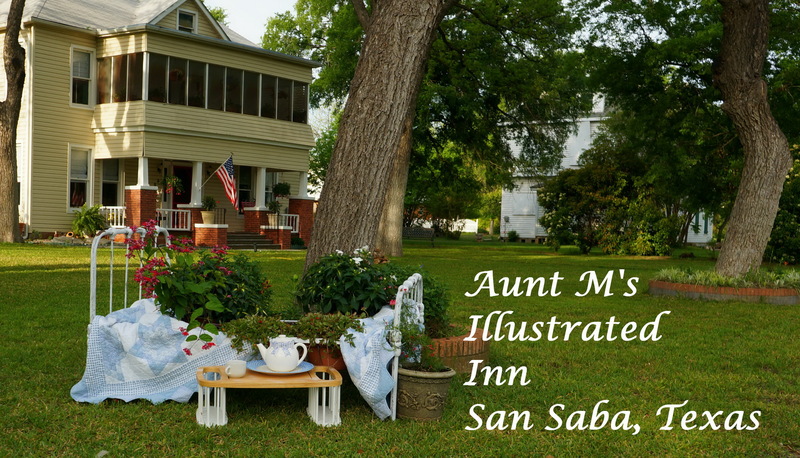 Come visit beautiful San Saba, escape the hustle and bustle of city life and stay at Aunt M’s Illustrated Inn, a cozy, luxurious, bed and breakfast. Old world charm and beautiful illustrations throughout the house make for a unique and memorable experience at a great place to stay . Located just a few blocks from downtown, we offer a quiet park like location away from noisy intersections. Relax and enjoy the peace and quiet of our large shaded lawn from our screened in balcony or front porch swing. All of our bedrooms offer privacy with entry directly from the front hall and private en~suite bathrooms.We have all the modern comforts with free WiFi, refrigerators , microwaves, and Direct TV with premium channels on large TV`s in each suite. Our guests love our super comfy beds, and the little extras, like our soft robes, hot water pot ,and ice maker just outside their door. Enjoy a scenic drive through the heart of the Texas Hill Country and find yourself in a natural sanctuary for the outdoor type. San Saba has something for you whether it is hunting, fishing, hiking, camping, or golfing. Spend a little time exploring our historic town and its many locally owned shops. Wine lovers can find themselves sampling from some of Texas’ best wineries. Shop like a real Texan and visit one of Texas’ largest selection of western wear at Harry’s Boots. Known as the Pecan Capital of the World, San Saba is home to everything possibly related to pecans. Whether you are looking for coffee, candy or baked goods you can find it here! 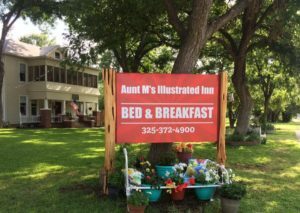 Local attractions include world famous suspension bridges, the ancient Wedding Oak, Colorado Bend State Park, award winning San Saba Golf course, and many more!